We bring the Seen, Read, Played strong this episode. We talk online piracy and it’s real world consequences. Surprisingly, Andrew makes a compelling argument on something important. We expound on The Defenders and Game of Thrones. Andrew discovers fun articles posted by a favorite Twitter feed. Patrick devours Mystery on the Orient Express. Chris prepares to read Monstress Vol. 2 as soon as Andrew returns Vol. 1. Patrick and Christopher play Path of Exile. The Brothers will all download and play with a Legendary Listener when the Xbox One version drops this week. Chris continues to love Civilization 6, seeking peaceful coexistence with neighboring nations. Andrew updates Star Wars Battlefront and struggles through its “Survival” game mode. Trivia is Oscar themed and turns out to be quite educational. This entry was posted in Podcasts on August 26, 2017 by BrothersGeekadmin. 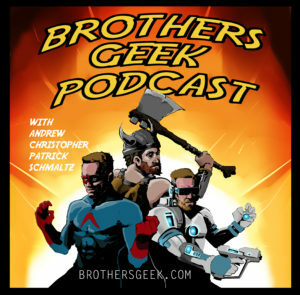 The Brothers Geek are extra Geeky and extra Brother-y this episode. We recap the most interesting content from San Diego Comic Con. We hope for the very best with the first trailer for Ready Player One and a new trailer for Justice League points to the DCEU finally getting the FUN. We can’t agree on the first 3 episodes of Game of Thrones. Chris and Patrick have seen Valerian and the City of a Thousand Planets and encourage Andrew to see it. But there isn’t any rush. We each sing a celebratory chorus about the magnificence that is Dunkirk. Chris and Andrew convince Patrick to read Murder on the Orient Express. Chris as two different games of Civilization 6 going on. Patrick plays Fortnite and has to explain what that is to Andrew and Christopher. Andrew plays Cup Pong on GamePigeon and laments that it isn’t real beer pong. Chris admits he has never played beer pong and Andrew questions if he actually went to college. Trivia is Agatha Christie themed and is impossible. This entry was posted in Podcasts on August 6, 2017 by BrothersGeekadmin.